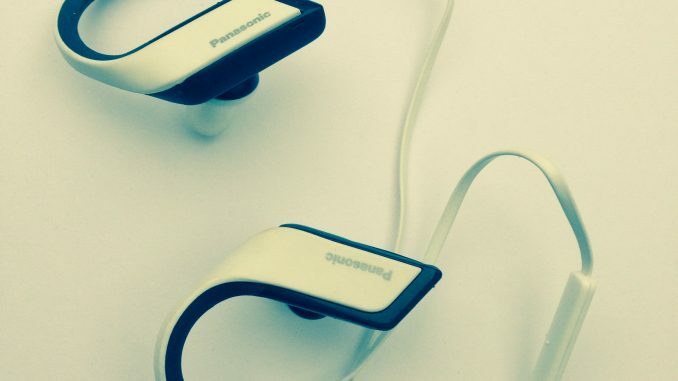 Panasonic Bluetooth Headphones – with wings! 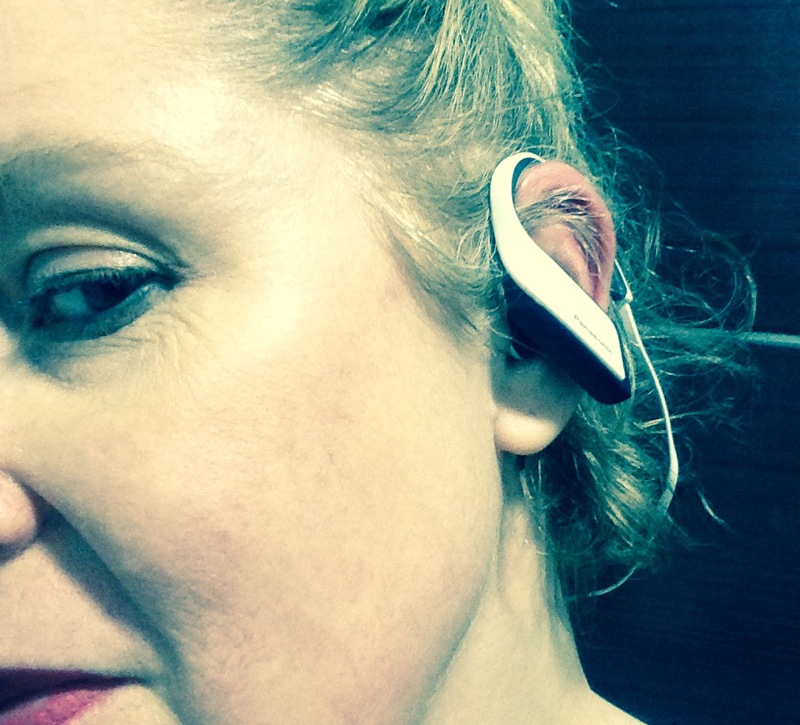 This week I’ve been trying out a new style of headphones at the gym – Panasonic WINGS BTS30 Wireless Sport Headphones, to be precise. The USP here is that they connect to your smartphone via wireless bluetooth technology and not via the usual long cable plugged in. I know this sort of tech has been around for a while and I am late to the party in trying something like this, but I was really keen to give it a go. I’ve knocked out the wire of my headphones several times with my flappy running hands, and it’s a real jolt to your exercising mojo when the Human League’s greatest hits suddenly crashes out mid-track. As you can see from the pics, these headphones consist of a moulded piece that fits around the ear, plus an inner ear bud. A small lightweight wire keeps it all together and fits around the back of the head. This wire contains a power button plus volume controls, so if you want to change anything you have to fiddle with this just below the ear. This fiddliness is probably the biggest down side, though once you get used to that they work very well. There is a microphone in one of the ear pieces, so you can take calls on the go. They’re waterproof and designed to shrug off sweat, water and rain. I wouldn’t wear them in the shower, but you should be OK on a rainy day. Estimated battery life is 70 minutes from a 15 minute charge. I’ve been using these wireless headphones for working out, especially when running on the treadmill. 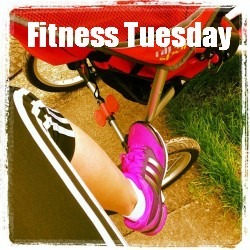 They stayed on really well during exercise, much better than the ear buds I had been using which had a tendency to fall out. Obviously they are a little heavier than ear buds to wear, but not so much that it’s a problem. 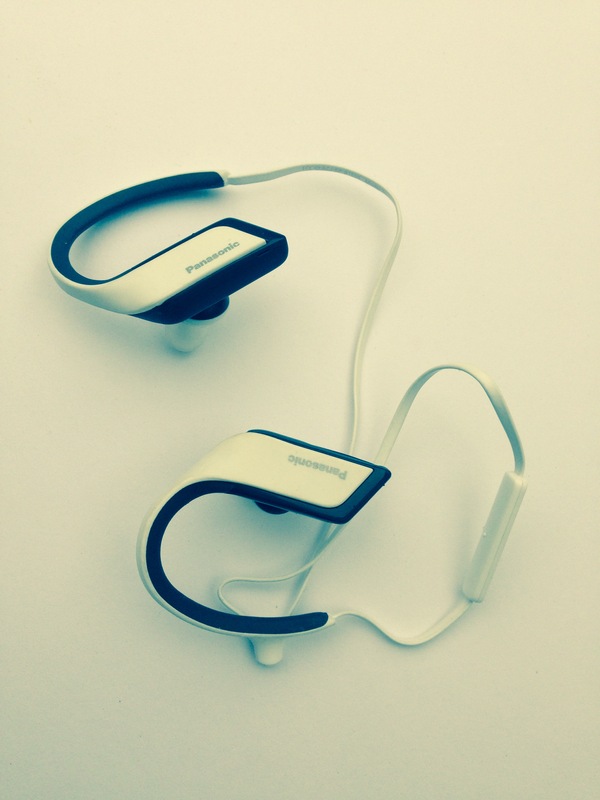 All in all I really enjoyed using these wireless headphones whilst running – it feels really free and natural. The sound quality is terrific. My family tell me that they couldn’t hear any noise leaking from the headphones when I was wearing them, for which they were very grateful as they do not share my choice of random Eighties classic tunes. The initial charge took me longer than the advertised 15 minutes, but once charged up I’ve had many hours of use. It took a few goes to connect to my iPhone5, but I suspect that’s more down to the phone than the headphones. I got there in the end. It’s a pretty simple set up, I think most people will find it straightforward and easy to manage. Once you’ve gone wireless, there’s no going back. Panasonic WINGS BTS30 Wireless Headphones (RRP £69.99) are widely available both online and in stores now. Currently reduced to around £45 on Amazon.